We humans aren't always logical. We know robots don't have feelings, but that doesn't stop us from getting attached to them. Kate Darling is a researcher at MIT's Media Lab, and she's fascinated by human empathy for robots. Recently she made a few folks very uncomfortable when she asked them to torture and crush a tiny robot. Take a walk through any self-help aisle in your local book store and you see ample evidence that people are obsessed with relationships. And for good reason. Healthy relationships are the foundation on which we can build better lives. But we may soon need to make a lot more space on those shelves. Because here come the robots. After what seems like decades of waiting for their impending arrival in our daily affairs, they're settling in. Robots have taken up residence in hospitals where they soothe patients with dementia. They're companions for people with severe autism. 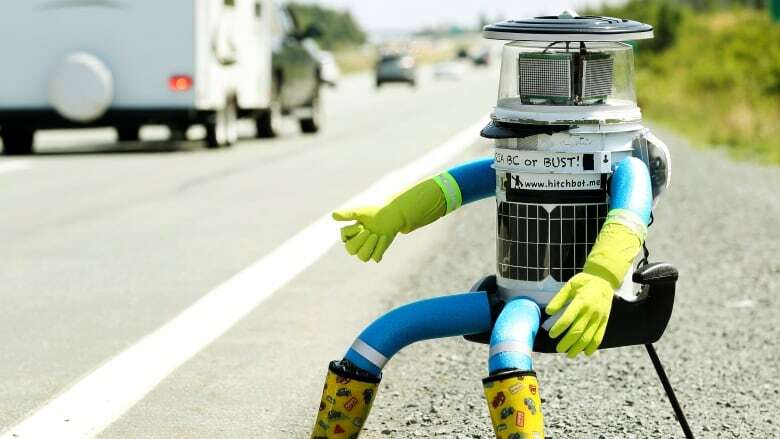 And they're even hitching rides throughout Europe and North America, as we witnessed with the recent, brutal demise of hitchBOT, a clunker of a robot who captured the imagination of thousands before meeting its fatal ending in Philadelphia. The reaction to hitchBOT's sorry ending was a remarkable mixture of glee and sadness, something that didn't surprise MIT Media Lab researcher Kate Darling, an expert in robot ethics who has long been fascinated by our emotional response to robots. Her latest research looks at what's behind some people's strong feelings of empathy for robots. She took tiny robots - about the size of a toothbrush head - called hexbugs. They have a small motor inside that enables them to zip around on tabletops. Kate Darling gave the hexbugs names and little back-stories, such as a favourite colour. And then asked people to destroy them. Some people refused to hit them. Others smashed them to smithereens. "One woman was muttering to herself "It's just a bug. It's just a bug" before she struck it," Darling describes. Participants were given empathy-measuring tests and not surprisingly, those who measured low on empathy were more likely to have no qualms about destroying the hexbug, while those who measured higher did. While Darling thinks that science fiction has primed us to be more comfortable with having feelings for robots, there's also a biological impulse. In one study, people observed a simple stick moving randomly in a room. Some participants ascribed intent to the stick's movements. "People would say "It was dancing" or "It was mad at me" so we are really biologically primed to respond to any kind of physical movement in our space like that." Darling says. How robots are programmed to elicit an emotional response is an important area of research. Some robots, such as those designed to be companions of sorts to dementia patients, are fraught with ethical issues. They can be a tremendous comfort to individuals, but the manipulation of vulnerable people's emotions to form an attachment to them is a tricky new frontier. "We're seeing these amazing results with robots and dementia patients," says Darling. "They're also serving as an alternative to medications in some cases." This trade-off in manipulating a patient's emotional reaction to an inanimate object in order to avoid medicating them is one area where researchers see a justification for fostering attachment. Darling also sees the time coming where society will be asked to consider whether some robots should have legal rights. There were signs of this in the reaction to hitchBOT's destruction. The outcry went well-beyond a simple reaction to an act of vandalism. She suggests our emotional connection to certain types of robots might lead to a societal push to punish people who vandalize robots. The abuse of certain types of robots could signal risks to living beings, much the same way that the abuse of an animal in a home where there are children can often lead to an investigation of whether those children are being abused. "I think that is certainly an argument for protecting certain types of robots from abuse," says Darling. If robots had free will, should we treat them like humans?